It is all about inspiring the reader to be the best version of themselves possible, and have the best business possible. This gives our advertisers the credibility they need to stand out in a sometimes-crowded marketplace. Is we allow business owners to become the expert in their industry by writing a matters page or column on their area of expertise. 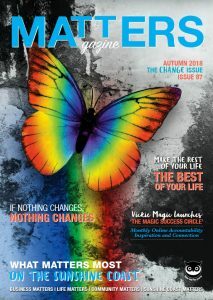 Get a FREE Mini Write Up in Matter Magazine! Of course, we will try and sell you advertising, but there is no obligation to sign up. We are a CONTENT drive magazine. 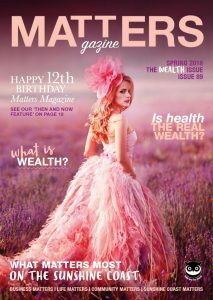 Matters Magazine is a quarterly publication about ‘WHAT MATTERS MOST ON THE SUNSHINE COAST’, it is all about inspiring the reader to be the best version of themselves possible, and have the best business possible. It’s about education, inspiration, and connection for like-minded business professionals and business owners. Getting your product, brand or service in front of people continually will inspire them to get to know you, get to like you get to trust you, and then buy from you. 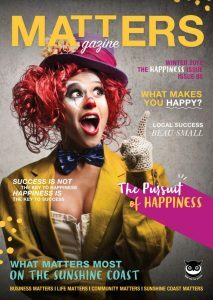 Don’t you just love our cover? What Makes us Boast on the Sunshine Coast! 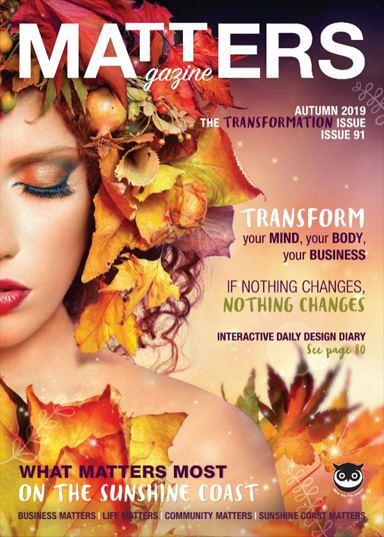 This issue of the magazine is our TransformationIssue and guess what, I’m on the ride of my life and I would love for you to be my side. Of course we will try and sell you advertising, but there is no obligation to sign up. 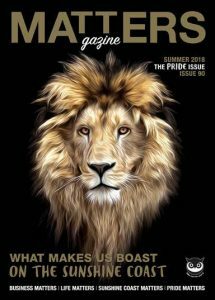 Copyright 2019 © Matters Magazine. Developed by Digital Organics.